Butterfly populations are constantly in danger of disappearing. Habitat loss is one of the leading causes of species decline. Here are some of the world's most endangered butterfly species. Range: U.S.A. - Wisconsin, Indiana, Michigan, Minnesota, New Hampshire, New York, Ohio, possibly Illinois. 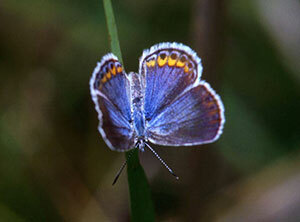 The Karner Blue butterfly was Federally listed as an endangered species in 1992. 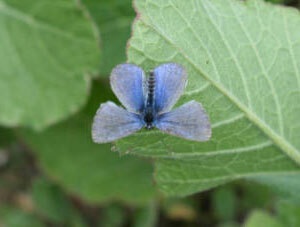 Karner Blue caterpillars feed only on the leaves of the wild lupine plant. This severely restricts where they can survive. Habitat throughout the range of the Karner blue butterfly has been lost as a result of land development and lack of natural disturbance, such as wildfire and grazing by large mammals. Such disturbance helps maintain the butterfly's habitat by setting back encroaching forests, encouraging lupine and flowering plant growth. The Karner blue butterfly's rarity and beauty make it a desirable addition to butterfly collections. Because butterfly numbers are so low, the collection of even a few individuals could harm the butterfly population. 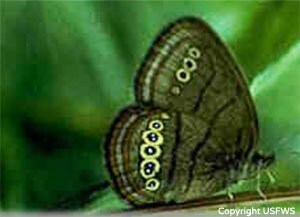 The Mitchell's Satyr butterfly was listed as endangered in 1992. It lives in wetland fens, low nutrient systems that receive carbonate-rich ground water from seeps and springs, which are also critically endangered. Most of this wetland habitat has been drained and filled to make way for urban and agricultural development. Also, invasion from exotic weeds threaten the fens on which the butterflies depend. In addition, contamination of fen wetlands by pesticides, fertilizer, and nutrient runoff from adjacent agriculture, including livestock production, poses a threat to the butterfly's habitat.Â It is believed that some populations of the Mitchell's satyr were eliminated by butterfly collectors. The Palos Verdes Blue butterfly was listed as endangered in 1980 and was feared extinct until it was rediscovered in 1994. Caterpillars are only known to feed deerweed and milkvetch. This butterfly's habitat is under contant threat of development. The population is also threatened by weed control, off-road vehicle use, non-native invasive plants, and fire suppression. Conservation intiatives include control of human use of the habitat, replanting of the host species, and a captive breeding program. This butterfly is one of the most endangered insects in the world. After Hurricane Andrew in 1992, there were no sightings of this species again until 1999 in Bahia Honda State Park. All known individuals were thought to be gone as of 2010. This leaves only a few scattered individuals in another population in the Marquesas Keys in Key West National Wildlife Refuge. The Macedonian Grayling was listed as critically endangered in 2010. The range of the Macedonian Grayling is extremely limited and only found in Macedonia. It's main threat is from quarrying. Researchers are actively surveying for new populations and studying the extent of quarry activity on the population. Raising public awareness and cooperation with quarry owners will be essential for long term successful conservation. The Wolkberg Zulu butterfly is a very elusive species, making surveying for the species difficult. Its population is threatened by habitat destruction from invasive species and human encrouchment. Larvae feed on lichens, which are very sensitive to environmental change.